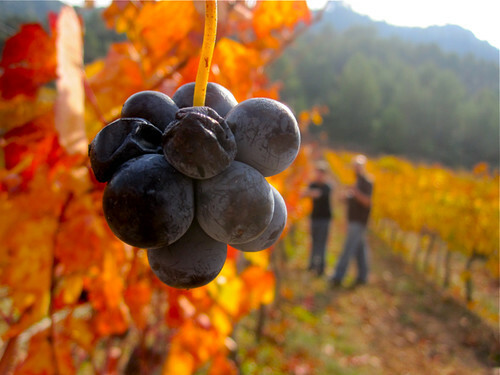 Cabernet Sauvignon is an imported grape to the Spanish wine making world. Considered a “foreign” by many, some regions have been planting it for so long that it’s now perceived as an autochthonous grape. In fact, in Evan Goldsteins book, Perfect Pairings (page 134), it is suggested that it might have originated in Rioja. Imagine that?! Cabernet with a Spanish accent! However, my sense is that this theory is purely speculative. Instead, I believe that Cabernet turned up in Rioja when the Bordelais appeared in the late 19th century, in an effort to escape the phyloxera epidemic that was plaguing France. And as a result of its planting, it spread like wildfire to the rest of Spain. Mind you, no one theory has been accepted as the golden truth, but regardless of its historical roots, Cabernet is here to stay, and it should not be considered a foreigner anymore. To those who say it’s an international varietal that does not belong in Spain I say they are simply full of themselves, this is a native grape as much as the next one. That said, Cabernet doesn’t thrive everywhere it’s planted, but when it does, it can make amazing wines. Check out the Bordeaux like blends of Somontano, the rich monovarietal versions of Castilla y Leon, the bold blends of Tempranillo and Cabernet that appear almost everywhere vines are grown in Spain, and without a doubt, the areas close to our neck of the woods: Penedès, Priorat, and Emporda. Post tweets, videos, Facebook posts, blog posts and check-ins including the “#Cabernet” hash tag on sites like Twitter, Facebook, Flickr, YouTube, Foursquare, Gowalla and others. This is one half of the conversation. You want to send out messages about Cabernet. For wineries, this can be content about your vineyard, winemaker, terroir, recipes, etc.. For wine drinkers, this can be what you’re tasting or who you’re tasting it with. If sending posts with “#Cabernet” is the first half of the online conversation, tracking the hash tag is the other half. It’s all about talking and listening, but using social tools to do it. On Twitter you can use Tweetdeck, Twitter Search, Google, Twitterfall, Radian6, JIVE, etc to see what people are saying. Like Brian Solis says, Engage! You have hundreds, maybe thousands of people talking about Cabernet. Find people you want to connect with and engage with them. “Like” Facebook posts, RT tweets, share or reply to other people’s postings. You have a captive audience all tuned in to the same thing. It’s an opportunity to form new connections online. Why would you want to do this? A large, captive audience will be talking about the same thing at the same time. Technology allows us to find and connect with people we want to keep connected with going forward. We’re going to do something simple today. First dig into our cellars, find some Cabernet, and then start the grill. We’ll post some comments on our wines at Adegga.com and maybe even do a quick video for all of you to post at the bottom of this post. If you like Cabernet, or just want to try a new one, let us know what you find, and share it in the comments below!